Though a big part of what made Thor: Ragnarok such a delightful change from Marvel’s other Thor films was its refreshing decision to embrace the visual whimsy of Jack Kirby’s style, the movie also owed a lot to writer Greg Pak’s Planet Hulk storyline from 2006. The series of events that unites Thor, Loki, Hulk, and Valkyrie in Ragnarok borrowed heavily from Pak’s Planet Hulk, in which Bruce Banner is jettisoned into space and sucked into a wormhole before he lands on Sakaar, a planet where he’s forced into gladiatorial combat. 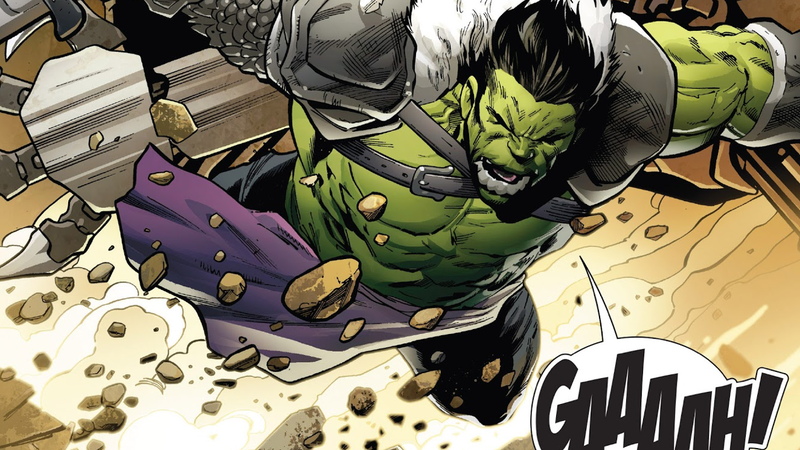 Planet Hulk’s gone down as being one of the most memorable Hulk stories in the character’s history and it’s one that Pak’s revisiting in this week’s Incredible Hulk #711, with illustrations from Greg Land, Jay Leistein, and Frank D’Armata. Like most people living with gamma radiation coursing through their bodies, Amadeus Cho has found it difficult to control himself as of late. While he’s always fancied himself the smartest, most composed member of the Hulk family, a series of inexplicable, rage-filled blackouts in which his Hulk persona takes over lead him to conclude that the only way to ensure the Earth’s safety is to leave until he can get ahold of himself once more. While drifting in space and contemplating his options, though, Amadeus receives a distress signal from Sakaar, the formerly enslaved planet that Bruce Banner managed to liberate during his first visit there. Driven by his thirst for adventure and the need to escape his own life, Amadeus willingly travels to Sakaar, only to find the planet once again being terrorized by yet another strongman—a man known only as the Warlord. The people of Sakaar live in fear of him and the Warlord sees the people as disposable playthings for his organized death matches. Amadeus willingly enters the Warlord’s gauntlet in a bid to free the clan of enslaved, red-skinned aliens who took him in when he first arrived on Sakaar and at first, everything’s fine. After having a (internal) conversation with his Hulk, Amadeus easily clears the Warlord’s feats of strength... or so Amadeus thinks. Moments after his final opponent is felled in battle, the Warlord explains to him that there are five levels of difficulty in the gauntlet and that Amadeus had merely cleared the first. After he successfully makes it through Gauntlet’s second round, Amadeus is invited to dine with the Warlord’s champion; during their conversation, Amadeus begins to learn more about what’s happened to Sakaar. With the Hulk who liberated them gone, Sakaar’s society has become ensnared in the Warlord’s grip and his thirst for blood sport. Competition is the only thing that keeps anyone alive and Amadeus grapples with the idea that the only way to truly free his newfound friends is to completely Hulk out and stay on Sakaar to rule as a benevolent leader. As Amadeus steadily works his way through the Warlord’s gauntlets, another clan of Sakaar natives desperately try to pull something or someone else from Earth in hopes that they might be able to defeat the Hulk. Turns out the Warlord’s rules state that whichever clan elects a champion capable of winning the gauntlet will be spared death—and the best bet at defeating the Hulk lies on the other side of a wormhole leading to Earth. Unbeknownst to Amadeus, someone else does eventually come through the wormhole to do battle. Obviously, the circumstances are a wee bit different here, but the Ragnarok inspiration is obvious and delightful. Unlike his Ragnarok counterpart, the Odinson’s the savage beast in this fight and Hulk’s the one trying to be reasonable, but it’s only a matter of time before that changes and their brawl gets ugly. It’s not often that you see one work of art reworked to incorporate stylistic and narrative elements from another piece of art that it helped inspire, but that’s just what issue #711 is. The more you think about it, the more the comic is a damn near perfect circle—a narrative and stylistic feedback loop between comics and film. It’s all working in perfect harmony to remind us that Marvel’s influence on the pop culture landscape is only growing more encompassing.